♥Cozy Polyester fabric,classic vintage style are just for your high taste and unique temperament! ♥This series of Oriented Beauty Dress combines classic beauty with modern fashion! ♥All the dress are suitable for daily casual/holiday/party/banquet or other occasions! ♥Wearing the dress,you will stand out and gain amazing performance around women ! and timely customer service.We treat our customers with heart. Ocassion: Suitable for daily casual/holiday/prom/party,etc. 1 Hand wash.Before the first washing,soak your dress in salt and vinegar water to prevent fading effectively. 2 Wash with cold water.Scrub gently instead of too hard. 3 Do not dry in direct sunlight; better to hang out in ventilated place. Please kindly accept a small error for manual measurements and little color difference between pictures and actual item. If you like our dress,please add it to the shopping cart without hesitation. Welcome to click our brand name HÖTER for more EXCELLENT styles. 1.NEW STYLE : HÖTER latest series of vintage style dress,combines classic beauty with mordern fashion,helps you show your different temperament,highlights the unique beauty of you. 2. EXCELLENT FABRIC : Cozy Polyester and silk fabric,provides you with the most comfortable wearing experience.Especially suitable to wear in spring and autumn. 3. 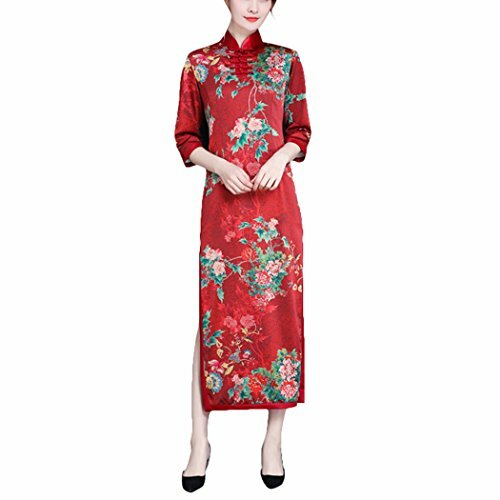 GOOD DESIGN : This oriental Qipao dress featuring slimming version and printed flower pattern,your high taste and elegangance can be shown to the greatest extent. 4.ABOUT SIZE : We have six sizes to meet every lady's need,please refer to the size chart carefully.If you prefer looser wearing effect,one size larger may be your good choice. 5.WORTH PURCHASE : This wonderful Cheongsam dress will be packed in HÖTER exquisite bag,it can be a fantastic and unique birthday/Valentines gift for ladies.Click our brand HÖTER for more excellent styles. If you have any questions about this product by HÖTER, contact us by completing and submitting the form below. If you are looking for a specif part number, please include it with your message.